It is a fantastic typewriter, very interesting. Click on the "Byron" label just above the comments to learn more than you ever wanted to know. Just read through it. A whole lot of information in that post. Read like something from Robert Messenger! The key-lock is really neat. However, can you take the keys out when you are using it? Or do they have to stay in? Wouldn't that have been terrible if it did not come with any? Thanks for linking me to that. Never had the chance to read it before. Awesome. A key has to be in the typewriter if you're going to use it (the second key is a spare). If it had come with no key, I would have been baffled for a while! Eventually I guess I would have figured out the problem and take the typewriter to a locksmith. I'm sure it would have been a first. I couldn't agree more. 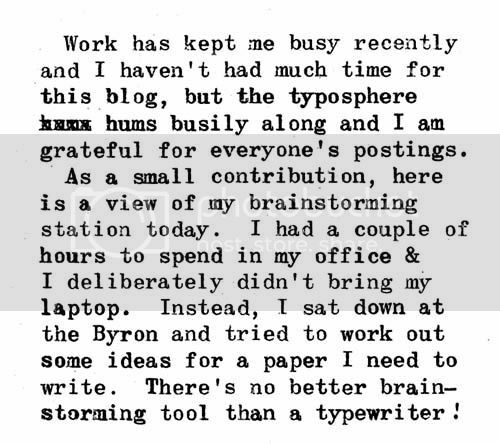 For me, brainstorms are directly proportional to the size of the typewriter. That's why I use a desktop too. Also, What a great little corner to think! There you go, Byron the Behemoth. You should've put its Mini-me beside it for contrast. Ha ha, yes. People can see the contrast if they go to my story about the Byron and look for the "Big Brother and Little Brother" photo. I always enjoy seeing where people use their typewriters. Your Big Byron Beckons with Bulging Brilliance! 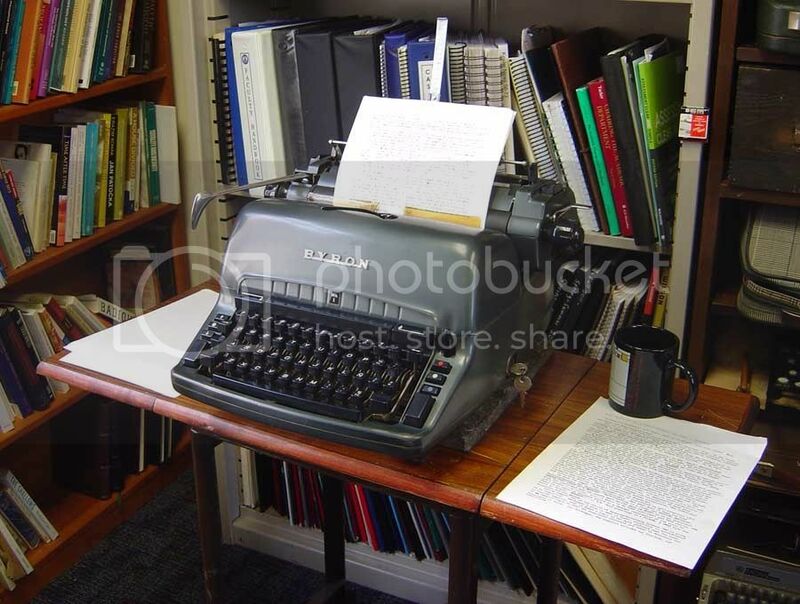 That is a wonderful looking typewriter. It's size makes it look rather powerful, like a Chevy SS 396 & dual quads. I too, thought it was an ignition key. My God, what were you brainstorming on that thing? The end of the World!!?? And as for its poetic/romantic name of 'Byron', well that doesn't fool me for a second. That machine could kill. Wow! I could storm my brains out on that thing. I love the almost brutal styling.